Another night, another great event. Today was the unveiling of the Youth Justice Board's recommendations for improving New York City's alternative-to-detention programs. 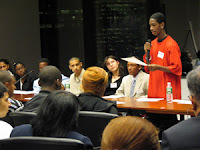 Before an audience of about 100 people, including Gladys Carrion, the commissioner of New York State's Office of Children and Family Services, the teenage members of the Youth Justice Board made an hour-long presentation at the midtown offices of Patterson Belknap. Over the course of a year, the members, who come from various public schools across the city, studied how delinquency cases are handled in Family Court for a year before coming up with a set of suggestions for how to reduce the use of detention. Their report, "Strong Families, Safe Communities" is an impressive piece of work. It should be available on our website soon -- check it out. In the meantime, Linda, Dory, Matt and Jackie deserve to sleep well tonight -- they put an enormous amount of energy into making today's event a success. A National Commission on Criminal Justice?